The Costa Brava boasts crystal clear waters and golden sandy beaches with a backdrop of intense green landscape. It is this image that best represents the Costa Brava. An idyllic setting on the Mediterranean. 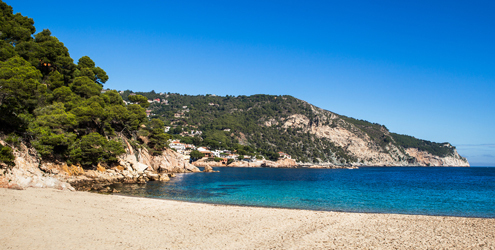 Some of the best know beaches: Gola del Ter, Cala Montjoi, Cala Joncols, Port Bo in Calella de Palafrugell, Pals, beach, El Codolar in Tossa de Mar and Castell and Cala Estreta in Palamós. The diverse coves and beaches offer some areas of worldwide fame such as the Medes Islands a unique place in the Mediterranean for scuba diving.